The CLEAN WATERWAYS team has arranged a room block at the Hilton St. Louis at the Ballpark, located on 1 South Broadway in St. Louis, MO. The Hilton is our host hotel and event location for CLEAN WATERWAYS 2018. The location has a 360 Rooftop Bar on the 26th floor, 3 markets and 1 Starbucks, as well as complimentary WiFi, an airport shuttle, fitness room, pool and more. Our conference will be taking place at The Hilton St. Louis at the Ballpark. 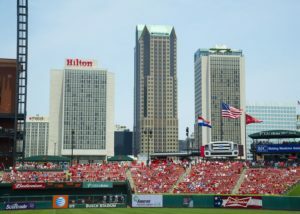 The hotel is located near Busch Stadium and the Gateway Arch in the heart of downtown. Click here to view information on things to enjoy in St. Louis! St. Louis in April has a varying daily temperature, so please be sure to pack layers! During the day it ranges from 62 – 72 degrees, dropping as low as 47 degrees at night. Be sure to pack comfortable shoes for long show days and fun nights!